Pony Rides start at $200 + tax. We bring our ponies to you and walk the ponies for your guests! 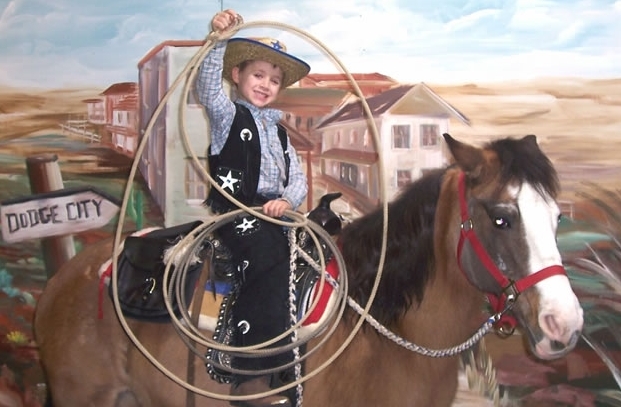 We provide pony rides for birthday parties, corporate events, school fairs, festivals and more! Call us at 410-761-7881 or email us through our contact form for availability and pricing. We also have the Hottest New Theme: "The Unicorn Party"
Check out our unicorn themed parties here! Contact us for more details and customizing a party package to fit your needs. Children love our beautiful and gentle ponies! We are not just a company owning ponies and renting them out. Horses are a family thing and a lifestyle for us. Sam (dad) is the whole purchasing department and an expert on choosing animals with great attitudes. "Dad" has the knack whether it's a gentle pony for your backyard or a sensible horse or pony with an athletic ability for the show ring. Heidi (mom) handles two departments; she's in charge of the grooming and dietary needs of the animals and does her job well! Matt and Ashley? Well, they are our product testers. The pictures below will show they created their own tests. At ages 10 and 11 they have survived and are quite accomplished in the show ring. We hope you appreciate the time we take in choosing the right animals for the job. It's your kids we are keeping safe. Not every child will be able to own a pony, but they can certainly have one on their special day! We hope that we can be a part of that day. Call to find out more information and get pricing and availability. A great craft to add to your party. Kids of all ages like to color. Let them color their own masterpiece and take it home as a party favor. The Pony Tee Shirt or Knapsack are a great theme with Pony Parties. Please ask for the available selections. The tee shirts come in three sizes. Some people accused our family of growing up on horses. Matt was out to prove it. Matthew Kern at age 4 stands on top of his horse. Matt auditioning for a job as a pony walker. He has his rider properly secured. Car manufacturers use test dummies. But Matt improvised and and found his own rider to test out his pony! Matt is thinking about the rodeo just like his dad! This horse was bought in September 2009 at an auction house reject purchase. This team is beating adult riders 8 months after the purchase of Ziggy. The previous owner said, "He can't run!" Ziggy can not only run, but does it with no whip or spurs like all the other horses in our barn. The horses love the care we give them as Ziggy had no previous experience in Barrel Racing and has never been ridden by anyone other than a 10 year old. The early consensus was Ashley had a “driving desire” when it came to ponies! What do you think? Ashley ditched the Barbie Jeep and bought a saddle. No batteries are required now! Step ladder not shown to get on this horse! JP was a Ranch Horse previously owned by Charlie Battles (Reba McEntire ex-husband). He wound up in Pennsylvania at an auction house and was sold by a horse dealer who was nice enough to sell him with a warning stating, "He is a man's horse." Sam bought him and the rest is history. He went from being a horse who wouldn't eat a cookie, wouldn't let you touch his ears, bucked when you pulled his saddle tight, and striking my wife in the chest with both front hooves to a wonderful pet and champion athlete. Now he chases me for cookies, lets me grab his ears, nickers when we are near, and consistently wins Barrel Races with a jockey nearly twice as heavy than his competitors. We get so many compliments on this forse. He is family and we nearly had him sold for 10 times his purchase price price, but the sale fell through when the purchaser was not able to get the results she expected. Oh well, Sam is not unhappy as he likes seeing the positive results and changes from the care/training the animals receive once we purchase the horse. Everyone loves JP and he knows it.